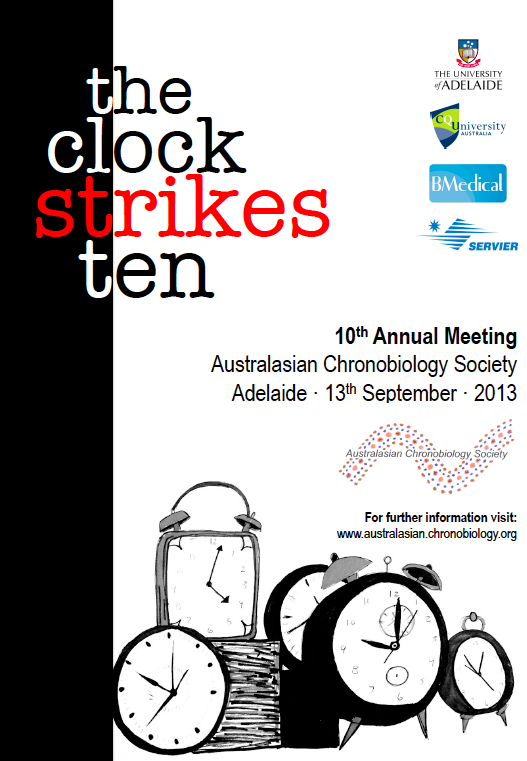 The 10th Annual Scientific Meeting of the Australasian Chronobiology Society was held on Friday 13th September 2013 at the National Wine Centre, Adelaide. The Keynote Speaker was Professor David Kennaway from the University of Adelaide. Dr. Michael Boden, University of Adelaide; Dr. Tamara Varcoe, University of Adelaide; Dr. Leewen Rattanatray, University of Adelaide; Dr. Xuan Zhou, CQUniversity; Dr. Charli Sargent, CQUniversity; Associate Professor Sally Ferguson, CQUniversity; Professor David Kennaway, University of Adelaide. Dr. Michael Boden, University of Adelaide; Dr. Tamara Varcoe, University of Adelaide; Dr. Leewen Rattanatray, University of Adelaide; Dr. Xuan Zhou, CQUniversity; Dr. Charli Sargent, CQUniversity; Associate Professor Sally Ferguson, CQUniversity.